These are not quite the perfect look that I was after but they have gone down so well with the kids. It was definitely time to put the Baker perfection in me aside – we had such great fun assembling these cookies that I decided to show them anyway. I will make them again for nicer photos but for now, embrace the mother in me! A sugar cookie recipe that I have used time and time again – just made a little more child friendly with oodles of gel food colourings! Warning: Liquid food colourings will not work for this recipe – someone comes along and steals all the colour the minute they go in the oven. * Experiment with different flavours – Lemon, Lime and Orange Zest all work really well in these cookies. Use the zest of at least 2 x whatever fruit. After 1 hour - remove from the fridge. Slice the dough in half - keep one half in the fridge and split the remaining half into 6 even pieces. 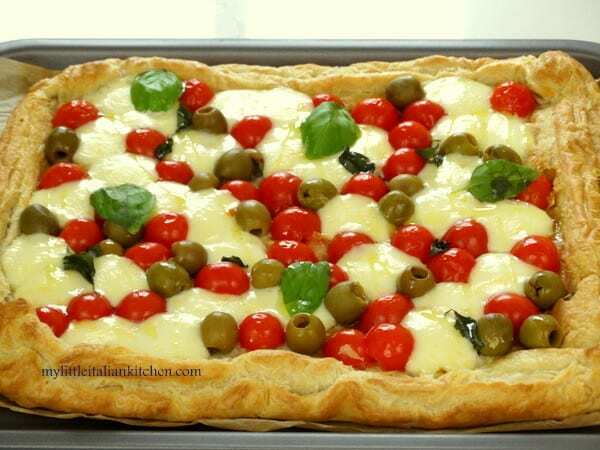 Whilst we are having a colourful week, I thought I would choose Alida from My Little Italian Kitchen as this week’s featured baker – This week she has shared her Tomato, Mozzarella & Basil Puff Pastry Tart in wonderful Italian colours. 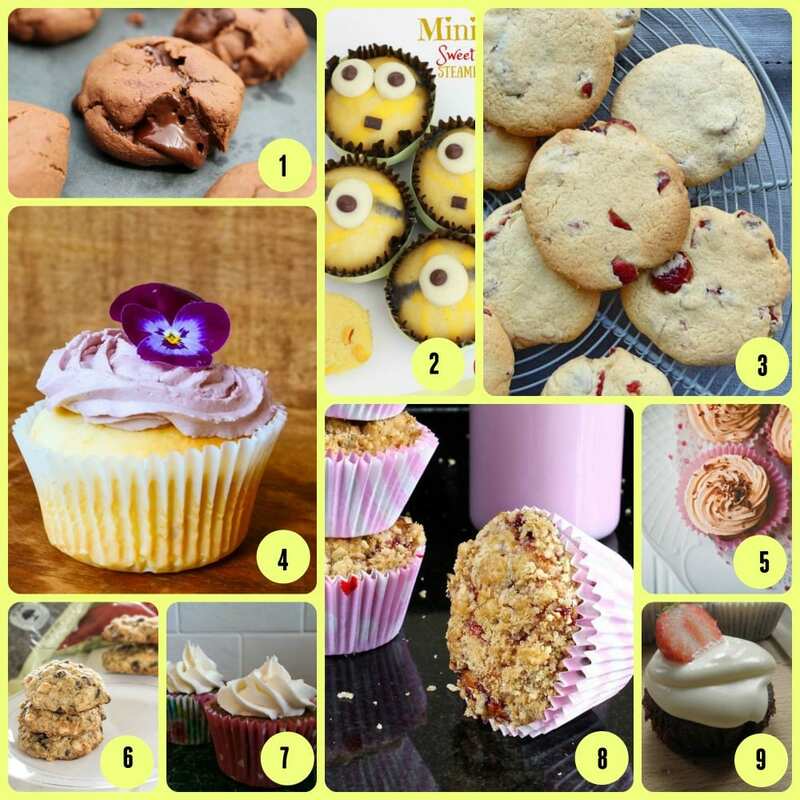 We are starting this week off with an abundance of cookies and cupcakes – One can never have too many! 2. Its been the week for Minions (My kids are uber excited about watching the Minion movie next week – will you be watching it?) ET Speaks from Home came up with these brilliant Steamed Sweet Corn Cakes decorated as minions. 4. These Blondie Cupcakes from Lemon & Lime Thyme are just perfection – The purple Blackcurrant Buttercream with those pretty flowers are too cute! 5. In answer to Truly MadlyKids’ question, Yes! Real men do eat cupcakes – At least they all disappear very quickly in this house and it certainly isn’t me and the kids that eat the most! Blondie Cupcakes looking wonderful. 8. Baking her way through a broken freezer is the Gluten Free Alchemist with Strawberry Crumble Muffins – Doesn’t look too much of a hardship to eat these to me! 9. Bringing back memories of a recent visit to the US with beautiful Red Velvet Cupcakes is Nic’s Bakes – Does anyone else really fancy some Cream Cheese frosting after reading this post? Lets move onto Breakfast and Bread Products – Perfect way to start the weekend! 15. Dream Baker is even tempting me into making Slow Cooked Pork in Cider which take a whole 3 days to come to fruition – They actually look and sound worth the effort though! Read her post! 17. Domestic Gothess is making bread special with her Pain a la Creme – Otherwise known as Double Cream Bread Rolls. How decadent do they sound? 18. I wish I hadn’t demolished that Chocolate Orange quite so viciously last night after seeing these Pain a la Creme from Giraffes Can Bake. Never mind, a good excuse to go buy another! 21. Caramelised White Chocolate & Macadamia Nut Ice Cream from Giraffes Can Bake – I dare you to look at these photos without yearning for some! Stunning! 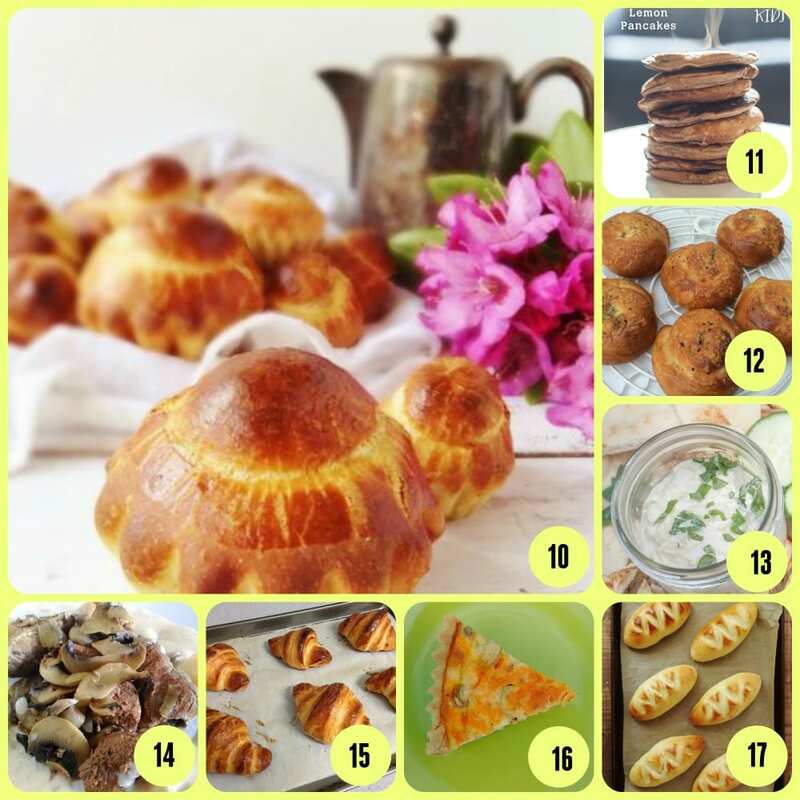 Many thanks to those of you who volunteered to cover #Bakeoftheweek during our summer holiday – I still need a couple more, so if you are tempted, please shout. Please add the badge to your post when entering so we can spread the word and more bakers can find us and join in. 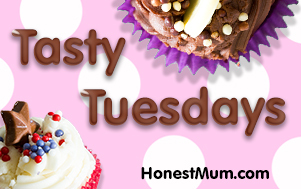 I love the variety of bakes – all welcome! I’m going to try to be earlier next week in posting – These Wednesdays just keep speeding up! Joining in with Cakey Boi (HOST) and The Baking Explorer for Treat Petite. 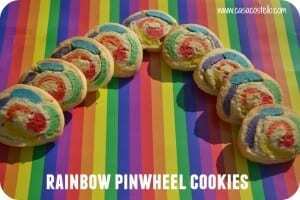 The cookies look really scrummy, I think z would love making these! Thanks! Every time Tara saw one – she declared that she had made them! Thank you including my Red Velvet Cupcakes in the round-up!! I’m now a convert to cream-cheese frosting!!! Oh me too – Could eat the stuff off a spoon! Oh they did, Holly – But they didn’t last long! Oh do Kat – let me know how you get on! Thank you for featuring my tart! 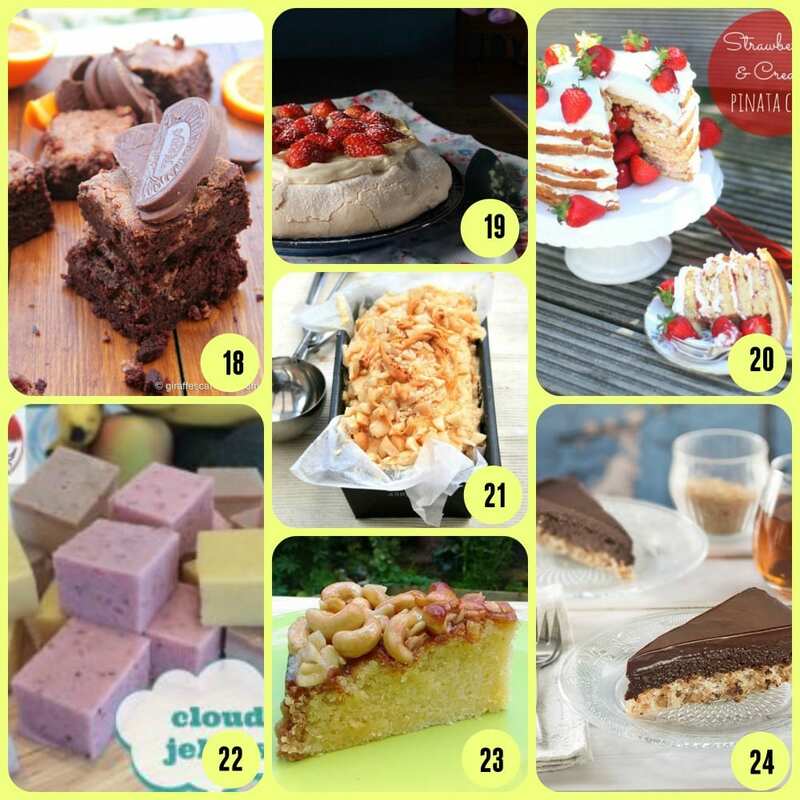 It must not be easy to choose among all the delicious entries every week. Your cookies look really cute! There’s definitely some very talented bakers amongst us Alida! They didn’t last much longer in ours! 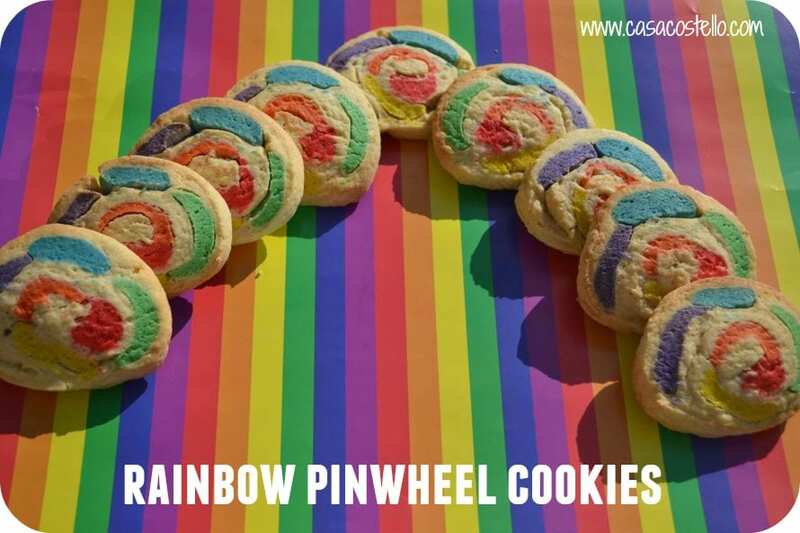 It takes such patience to do stuff like this – I only tried two colours (normal and chocolate) for some pinwheel cookies and they were a disaster! I think it was a good evening that ensured we all had the patience! Very simple really. 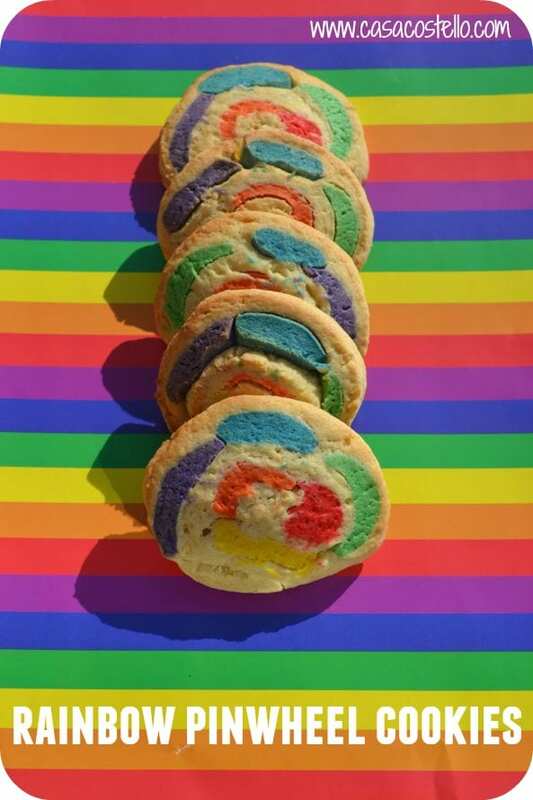 Love those colours, such cute cookies! Thanks Lucy – Trying not to think about the food colourings! Gel food colourings work so much better than liquid colourings – I’ve definitely had my fair share of disasters! What brilliant cookies! I love them! And since we are entering ‘birthday month’ when the kids need treats for their parties I may just have to have a go at making something like this that is gluten and dairy free! !